Prince George is one of those gateways you first visit on business , then yearn to return to for pure pleasure in the great outdoors. Wilderness adventurers consider Prince George their gateway to paradise, and a glance at the map will tell you why. This former fur trading fort is the key city in BC's North by Northwest tourism zone- a vast area stretching from the Alberta border to the Pacific and northward to the Yukon. Located at the confluence of the Nechako and Fraser rivers, Prince George is an excellent base for canoeists, hikers and anglers. There are a total of 117 parks in the area for visitors and residents to enjoy. Hikers and anglers head to Raven Lake and to the alpine meadows and other fishing lakes of the Grizzly Den Recreation Area, which has a superb trail system. When Alexander Mackenzie passed through the area in 1793 and noted that it had potential for European settlement, he wasn't far wrong. In 1807 the Hudson Bay Company fur traders established Fort George and this evolved into the City of Prince George in 1915. Canada's two largest carriers serve Prince George and our region with direct service to Vancouver 11 times daily. Central Mountain Air and Northern Thunderbird Air connect the north and BC's interior through scheduled and charters services.  Fully serviced airport terminal Classified by Transport Canada as a Class "A" airport, in 1994 Prince George Airport received the region's Excellence Award for Environmental Management. There is a steady increase in the number of passengers using the airport, aided by the increasing number of flights in and out of Prince George. More about Prince George: BC's Northern Capital, Prince George (population 75,000) is located at the junction of the Fraser and Nechako Rivers and is 300 air miles north of Vancouver. While tourism is booming and manufacturing on the rise, Prince George's economy is still forest industry-based, with 15 sawmills and 3 pulp mills. 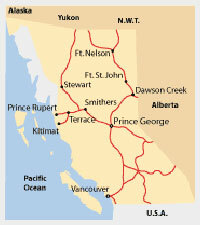 Prince George is an important highway junction- the Yellowhead 16 (East/ West) and Highway 97 (North/ South)- and railway crossroads for BC Rail's Cariboo Line and Via's Skeena Run. The area has a perfect blend of natural landscape and city amenities. The city has four golf courses, five indoor ice rinks, over 60 ball diamonds and over 50 tennis courts. There are 124 parks set aside within city boundaries, the largest being Fort George Park , home of the Fraser-Fort George Regional Museum on the Heritage River Trail. Popular attractions include the Prince George Railway and Forest Industry Museum. The Fraser Fort George Regional Museum is located on the banks of the Fraser River, at a spot where Simon Fraser established the fort in 1807. It chronicles the development of the area from the arrival of Alexander Mackenzie and the fur trade. The Prince George Air Show in July , is an annual event featuring military jets, warbird aircraft, aerobatics and a static ground display. The Salmon Valley Country Music Festival is also in July. From Prince George, a pleasant side trip to Fort St James takes you along the Yellowhead Highway through ranch country, by rivers lined with cottonwoods and sparkling lakes. On the way, you pass through Vanderhoof, a town which marks the geographical center of British Columbia. It was named for Herbert Vanderhoof, a Chicago publicity agent hired by the Canadian government in 1908 to launch a campaign to attract settlers to western Canada. Fort St. James was founded by Simon Fraser, the explorer, in 1806. At Fort St. James National Historic Site, BC's oldest continuously inhabited community salutes its fur trading past. History lives on at this authentic Hudson's Bay Trading Post, with furs, trade goods, and staff in 1890s attire. One of the west's oldest fur warehouses, a clerk's residence and a fish cache remain.